First, there was December 7, 1941. Then there was September 11th, 2001. And, as long as we're solemnly memorializing national disasters, let's also not forget January 20, 2001. But there's another day that'll live in infamy (or ignominy on the Type A-list blogs) and that's February 3rd. February the third is Blogroll Amnesty Day, the only national holiday for which Hallmark or Gibson doesn't make cards. FTD florists do not send orchid arrangements to grieving B or C list bloggers and we weep silently in sackcloth and ashes in memory of the day we were cruelly cast overboard into a sunless and hitless sea like a sack of helpless, overweight puppies the day a certain blogger purged his sidebar. The sea was angry that day, my friend, and no human rights groups, no ACLU and no act of Congress can begin to redress our grievances or to advocate on our behalf. There will be no telethons begging for links and blogrolls. There will be no candlelight vigils mourning lost Paypal and ad revenue, no Memorial Wall in Washington, DC made up of Cheetos with our URLs inscribed on it. Jon Swift, the man who, while he didn't start it all, certainly finished it. Sort of. Well, actually, this won't be finished until the Type A list blogs finally break down and blogroll the two and a half million of us who also have political blogs. In all seriousness, the idea is to find five blogs, liberal or conservative, that you admire and to blogroll them if they get less traffic than you. Finding five such places that get less hits than this place would require more hours than there are during a weekend. But a quick look at my sidebar will see that not one A list blog is to be found while lots of B, C and lower blogs I admire are to be found aplenty. 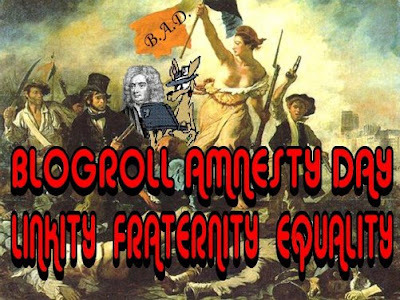 The official Blogroll Amnesty Day is February Third but, like John Thain before handing out four billion in bonus bailout bucks to his boardroom buddies (how's that for alliteration? ), Mr. Swift has moved up the festivities of this Blogger Festivus (where the airing of grievances is every day) so we'll be celebrating for four days starting today. So click on the links above to Mr. Swift's, Ms. bluegal's or Mr. Skippy's sites to get details and ideas on how you, too, can get your 15 seconds of fame. This post will remain at the top of the page until midnight February 3rd in order to show the proper respect to our fallen comrades who still cannot get back up. So new posts written and published between now and then will be beneath this. JP, if it weren't for someone elses blogroll I wouldn't have found your site, and thanx to your links I found such treasures as Fearguth's Bildungblog. Long live the roll. Hahahaha... Looks like I came back just in time JP! Didja miss me?. I'm relinking you now, since- believe it or not, I get less hits than you. Muahaha. Thanx to the blogroll of this site,I discovered Conservatives for American Values. Man,I had a LOT of fun at that site a few years ago. I always suspected BlueGal was behind the curtain for that one!